This question mentions the "Rule of 600" for avoiding star-trails in astrophotography. Stars move. Like with any other movement, what we care about is how much they move on the sensor during exposure: A movement that occurs only within a single pixel is not a movement the sensor can capture, i.e. the movement appears frozen. But when movement takes a point across several pixels during the exposure, it will be visible as movement blur, in this case star trails. A rule like the "rule of 600" is similar in spirit to the "rule of 1/focal length" for handheld exposure, in that it attempts to give exposure times that yield approximately the same movement blur for most focal lengths. The sky rotates 360 degrees in 24 hours, or 0.0042 arc degrees per second. Assuming a 24 Mpx sensor (6000x4000, e.g. Nikon D600), those 73.7 degrees are projected on to 6000 horizontal pixels, giving 81.4 pixels per degree. Assuming a 24mm lens, the "rule of 600" gives 600/24mm = 25 seconds exposure. In 25 seconds the sky will move ~0.1 degrees. For our 24 Mpx full frame camera with a 24mm lens, 0.1 degrees translates to 8.5 pixels. If we plug a 400mm lens into the same formulas, we get max 1.5 seconds exposure time and a 7.3 pixels movement during the exposure. So it's not an exact rule - the blur is slightly different for different focal lengths - but as a rule of thumb it's pretty close. If we were using a 1.5x crop sensor with the same 24Mpx resolution (e.g. Nikon D3200) and used focal lengths to give equivalent angles of view, we would have e.g. 16mm focal length, 37.5 seconds exposure time and 12.7 pixels blur. That's 50% more blur. In this case a "rule of 400" for the crop sensor camera would give the same blur as the "rule of 600" for the full frame example. Different stars move at different speeds relative to the Earth. The fastest movement is along the celestial equator, while the Pole star (Polaris for the Northern hemisphere) at the celestial pole hardly moves at all. 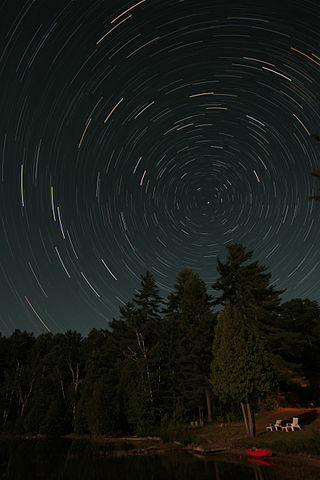 The effect can be seen in this picture from wikimedia commons: Polaris appears as a fixed point in the middle while other stars revolve around it, and the length of the star trails increase with their distance from Polaris. The calculation above is for the worst-case scenario, when the picture includes stars that move along the celestial equator. I guess the takeaway message is that the 600 in the "rule of 600" depends on camera resolution, sensor size, where in the sky you point the camera, and what you consider acceptable blur. Use a smaller number if you want less blur. Conversely, a higher number might be acceptable if you shoot a close crop of Polaris, use a low-resolution camera and/or target a low-resolution output format. The rule of 600 states that to 'eliminate' star trails the exposure time in seconds should be 600 divided by the focal length of the taking lens. 20mm lens could go to 30 seconds, 300mm lens could go to 2 seconds. Of course (like any motion blur) you will never eliminate star trails- you merely reduce the trail to an acceptable level for a given enlargement. The only perfect solution is a "perfectly aligned tracking equatorial mount" and there ain't no such thing. The etiology is difficult if not impossible- it's sort of like 'Handhold no slower than 1/focal-length shutter speed'- a rule of thumb or common wisdom that works in many but not all cases. When using a lens of focal length L to take a long exposure photograph of the night sky (with a stationary camera), the maximum shutter speed you should use to avoid blurring of the stars is 600/L seconds. For example, if using a 300mm lens, if you use a shutter speed of (600/300) = 2s or shorter, you should avoid seeing the stars as lines, rather than points, of light. As far as I can tell there is no record of who came up with the rule or how it was derived, however it would most likely have been based on trial and error using 35mm film, with the inherently lower resolution (grain) and lower tolerance (frame size) than today's cameras, and rounded up (or down) to a nice round 600. As for application, care should be taken. Modern digital sensors are much sharper than 35mm film, meaning there is less tolerance when it comes to motion blur. Additionally, most digital cameras these days have smaller sensors than the 36mm x 24mm of 35mm film, meaning there is EVEN LESS tolerance, so it should probably be adjusted to be more like a 400 rule when using these cropped-sensor cameras (that is, if you think 600 is still a valid value for full frame cameras, which is arguable). Conversely, if using medium format cameras, a larger number could be used. Although several of these answers dance around it, none of them point out that the "Rule of 600/500" was derived based on the assumption of a standard display size and viewing distance. That is: 8x10 inch display size viewed at 10-12 inches by a person with 20/20 vision. The standard display/viewing condition yields a circle of confusion of around 0.030mm for a 36x24mm film/sensor size, a CoC of around 0.020mm for a 1.5X APS-C crop sensor, and a CoC of around 0.019mm for a 1.6X APS-C crop sensor. The "Rule of 600" is a bit more generous and is based upon a CoC of around 0.050mm for a FF camera. Some of the wider allowance can probably be based on the difficulty of focusing precisely on stars with the film cameras in use at the time the rule was derived - Split prisms are useless for assisting with focusing on a point rather than focusing on a line so many astrophotos of the day shot with 35mm cameras were focused using the infinity mark on the lens' focus scale (or the hard stop at infinity than many lenses had at the time) and thus the stars in the resulting image were even larger blur circles than would have been the case with points properly focused. It's worthwhile to calculate more precisely for how long you can expose before you get star trails. If you use a rule of thumb and/or trial and error methods until you get things right, you'll likely underestimate the maximum exposure time which ultimately leads to more noise as you'll go about producing the final image in a less than optimal way. It is not difficult to calculate the maximum exposure time if you know beforehand what objects in the sky you want to photograph. The object is at a certain angle relative to the Earth's rotational axis, which is given by 90 degrees minus the so-called declination of the object. E.g. if the object of interest is the Andromeda galaxy, then [you can find here] that the declination is 41° 16′ 9″ therefore the angle w.r.t. the Earth's rotational axis is 48.731 degrees. If the field of view is large, you may not want star trails to appear to the South of Andromeda, so you then need to consider a larger angle. Suppose that you have decided that the angle is going to be and let's call this angle alpha. The camera sensor is at the center of the sphere so it is at a distance of 1 to the points on the sphere, this makes the velocity on the surface of the sphere also the relevant angular velocity in radians per second. Not the answer you're looking for? Browse other questions tagged astrophotography motion-blur stars or ask your own question. What speed to shoot stars at? Why does photographing the Milky Way require short exposure, when star trails need long exposure? How can I avoid star trails?